Missed morning BO trade Attempted BOF scratched. 2> Good move stops at 10 . 3> Pullback (Buffer zone) good sign. lets hold this trade. 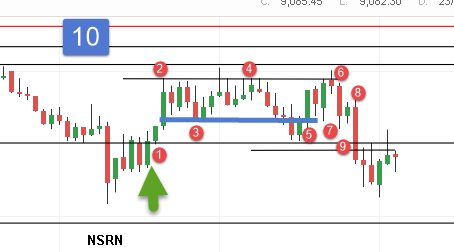 7> Strong rejection bar. If the price break below 5 lets exit. Top flip is proving too strong to break. After market stopped moving up, I marked a narrow range incorrectly. And I took a BOF expecting another leg up. How would you look at it? Nifty Future is guided by Nifty option strikes. Which are placed 50 pts apart. 1> BO of PDH lot of stops triggered. 2> Took support (pullback) at 9130 then moved one more leg till 9144. In total it has moved close to 40+ points. Don't expect another move unless consolidation of 1.5 - 2 hours. Logic being this will accumulate lot of OF hence chances of one more move is probabilistic-ally high. Any move of 40+ points is called extended move. Don't look for immediate move again. 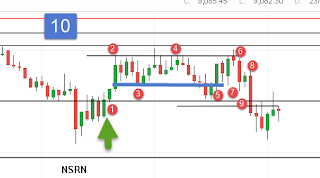 Also while drawing ranges it should be obvious. Just think will this range be visible in higher time frame. If yes go ahead and trade that range. Thanks! Visibility in higher time frame really drives the point home. Please give a briefing on how you trail your trades. You seem to trail, bit far, as a precaution against getting stopped out in case of TRAP. Do you follow the same strategy in case of shorts too? I manage the trade based on Price action. Posted thought process as 2nd chart. I follow similar thought process for long and short trades. The manner in which u managed trade was very nice. Will try to emulate you. Thanks. For me it is like knowing a person. More time you spend better you know them.